Dan Prindle is an experienced performer, recording artist, scholar, and educator. Dan has over 15 years experience as a private instructor of cello, bass, guitar, piano, composition, aural skills, and music theory. 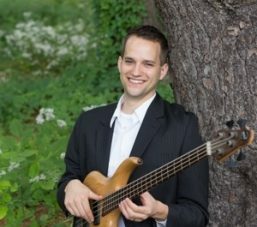 He currently teaches aural skills as a Visiting Instructor in Music at Williams College (Williamstown, MA) and music theory as a Graduate Teaching Assistant at the University of Massachusetts Amherst (Amherst, MA). He has taught the history of contemporary music as an Adjunct Lecturer at Goodwin College (East Hartford, CT) and at Williams, and has taught public school as a guitar instructor at Manchester High School (Manchester, CT). Dan is a Ph.D. candidate in music theory at the University of Massachusetts Amherst. His dissertation, which is currently in progress, explores historical methods for teaching harmony at the keyboard and offers suggestions for bringing these methods into the modern classroom. Dan also holds a Master of Music in music theory from UMASS and a Bachelor of Music in Composition from the Berklee College of Music. His master’s thesis is an extensive analysis of the famous suites for solo cello by J.S. Bach. Dan has presented his research all over the United States, including conferences at the University of Massachusetts, George Washington University (Washington, D.C.), and the University of Washington (Seattle, Washington). As a performer and recording artist, Dan has shared the stage and the studio with a diverse collection of commercially and critically successful artists. He began his career with Rane, an award-winning rock ensemble that, in addition to becoming a success in its own right, opened for such acts as The Allman Brothers Band, The Jerry Garcia Band, Tom Petty and the Heartbreakers, Wilco, Rusted Root, and Santana. After working with Rane, Dan became a freelancer, playing bass and cello with artists like Simon Kirke (of Free, Bad Company, and Ringo Starr’s All-Star Band), Kurtis John (of The Last Goodnight), Jennifer Hartswick (of the Trey Anastasio Band), Sean Kelly (of the Samples), and Rex Fowler (of Aztec Two-Step). His innovative and tasteful cello playing can be heard on recordings from innumerable artists, notably Frank Black (of the Pixies) and Mark Mulcahy (of the Miracle Legion). Dan appears on several tracks on Mulcahy’s 2005 release, In Pursuit of Your Happiness, an album that Thom Yorke of Radiohead called the best of that year. Dan is also a successful songwriter and composer. His style ranges from classically influenced chamber music to popular songs, and he has been equally successful in both genres. His portfolio includes works for a variety of ensembles including chamber ensembles, choir, accompanied solo vocalists, and symphony orchestra. Dan’s works have been given well received performances by various ensembles in southern New England. Most recently, his one-act opera A Charming Affair was premiered by the Hartford Opera Theater. Dan also released his first full-length album, titled Where You Land, in November. Im wondering if you teach 8th grade distance learning for music? My 13 yr old and I are professional fiddlers and she plays guitar. We would LOVE to further her musical education and understanding of harmonies, composition, and music theories with you!